1. Heat the oil in a large non-stick saucepan or karahi. Add the cumin seeds and cook until they have darkened and released their aromas. Add the ginger and garlic pastes and gently sauté for a minute, or until the garlic smells cooked. Add the onion and green chilli and sauté for another minute. 2. Add the tomatoes and all the spices and season. Cook over a high heat, stirring often, for 10-15 minutes, until the mixture is cooked and releases some oil back into the pan. Taste; the flavours should be harmonious. 3. 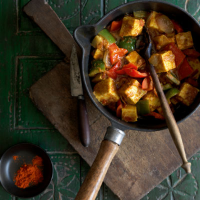 Stir in the paneer, peppers and a good splash of water from the kettle. Cook for three or four minutes, or until the peppers are crisp but tender and the sauce is thick and clinging to the vegetables. Add the cream, taste and adjust the seasoning, and serve. Cook's tip: Served with naan or paratha, this dish makes a fantastic vegetarian main course. This recipe was first published in Tue Jul 23 12:02:00 BST 2013.